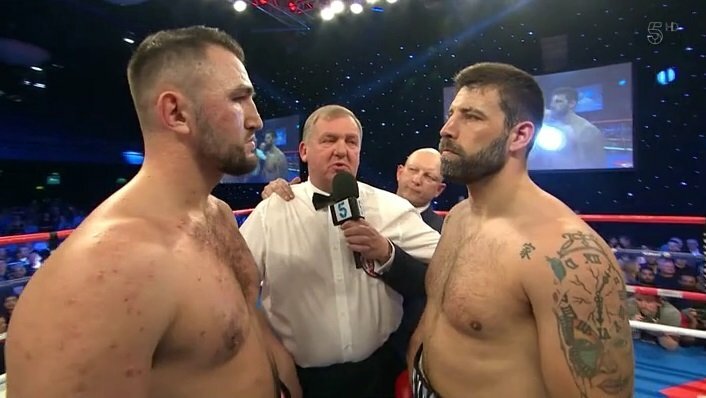 Hughie Fury (21-1, 11 KOs) captured the British heavyweight title on Saturday night in beating Sam Sexton (24-4, 11 KOs) in the 5th round after knocking him down 2 times at the Bolton Whites Hotel in Bolton, UK. Hughie landed a hard right in round 5 that sent the 33-year-old Sexton down. Sexton climbed off the deck and wanted to continue, but referee Terry O’Connor waived it off. The time of the stoppage was a 2:04 of round 5. Sexton never really was competitive in the fight. Hughie was always in motion, hammering Sexton with right hands and jabbing him frequently. Sexton had some success at times when he got in range to throw his left hook and right hand. Hughie did a nifty job of leaning away from most of the shots that Sexton threw at him. Hughie would then move out of range before Sexton could follow up with anything. What Sexton lacked was quick feet and the forward pressure needed to cut off the ring on Hughie. Sexton was moving too slow, and not pursuing Hughie in a forceful enough manner to get to him. Hughie timed Sexton’s attacks in the 4th, and caught him with right hands when he was charging forward. was able to get past Hughie’s right hands a few times in the 4th to land his own punches, but he eventually was hurt late in the round when he walked into a shot. Hughie chopped down at Sexton with a right hand that sent him reeling backwards. Hughie followed quickly with a right that knocked Sexton down. He got up and off the deck and the round ended shortly after that. It was a good win for Hughie. He easily handled a fighter that world class level fighters are supposed to beat with ease. If this had been a difficult fight for Hughie, then it wouldn’t have boded well for him. He’s got to be able to beat domestic level heavyweights with ease for him to be taken seriously as a world class fighter. Where Hughie goes from here is the big question. He doesn’t wish to defend the British title against Joe Joyce. His father Peter Fury made that clear. They don’t want to fight Joyce. They want to go after a world title. However, it’s unlikely that Hughie will be fighting a top contender anytime soon. That’s the criticism that Hughie has received. He hasn’t fought contenders, and yet he was given a number 1 ranking by the World Boxing Organization last year and a title shot against former WBO champion Joseph Parker. Hughie lost that fight by a 12 round majority decision, and he did not put forth his best effort. If Hughie isn’t going to fight world level opposition, then he might as well fight Joe Joyce. That would be a good learning experience for Hughie. He’s got to be able to beat fighters like the 6’6” Joyce if he’s to have any kind of a chance against Anthony Joshua and Deontay Wilder. Fighting guys like Sexton isn’t going to get Hughie prepared adequately for what he’ll have to deal with when/if he faces Joshua and Wilder.